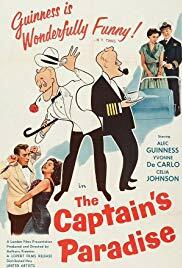 94 min [ He makes two-timing an art...and gets away with it ] - Mediterranean ferryboat captain Henry St James has things well organized - a loving and very English wife Maud in Gibraltar, and the loving if rather more hot-blooded Mistress, Nita in Tangiers. A perfect life. As long as neither woman decides to follow him to the other port.